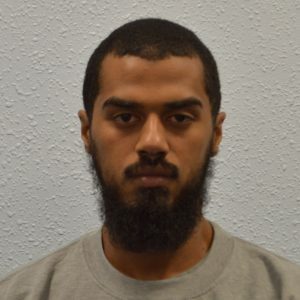 As a result of an investigation by UK Counter Terrorism Policing, spanning Afghanistan, Turkey and the US, a man has today been convicted of planning a terrorist attack and making explosives. A jury at the Old Bailey found Khalid Ali, 28, of north London, guilty of preparation of a terrorist act – namely plotting to carry out a violent attack on police officers, MPs or military personnel in London – and two counts of making an explosive substance, after his fingerprints were found on bomb components in Afghanistan made by the Taliban. Ali was arrested during a proactive armed police operation on 27 April 2017 as he approached Whitehall equipped with three knives. This came about after the Met Police Counter Terrorism Command and intelligence services launched an investigation into his activities. The investigation began when Ali – a British national reported missing by his family in 2011 – appeared at the British Consulate in Turkey in October 2016, asking for temporary travel documentation to return to the UK, saying he had lost his passport. His unusual demeanour however, raised the suspicions of staff and the Consulate alerted the UK authorities. When Ali subsequently arrived back at Heathrow Airport in November 2016, police officers stopped him under Schedule 7 of the Terrorism Act 2000. They took his fingerprints as part of their enquiries and he was released, returning to live with his family in north London. The fingerprints were shared with the US authorities who found they were a match for fingerprints identified on a number of bomb components recovered from Afghanistan in 2012 and made by the terrorist organisation The Taliban. The police investigation continued and on 26 April 2017 – the day before Ali’s arrest – covert officers observed him visiting a shop in Edmonton and then dumping packaging in a bin. 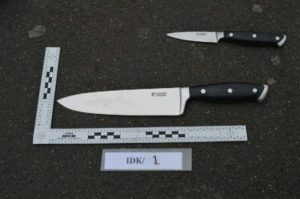 Covert officers retrieved the packaging – the containers for several knives. That evening, and separate to the covert operation, local officers were also called to Ali’s home address where they found his mother was in a distressed state. She told officers that she was fearful for her family’s safety after Ali had become angry and that she had also found four knives in Ali’s bedroom. Ali then left the family home – leaving the knives behind – but not before asking the local officers questions about the capability of their Tasers. His curiosity in the items was to be just one example of his fascination with the police. The next day, armed officers swooped on Ali, who, by that time, had obtained replacements for the knives he’d left at his family home. Following his arrest, counter terrorism police trawled through hours of CCTV to piece together his movements in the preceding months. They recovered CCTV of him carrying out hours of hostile reconnaissance at a number of significant sites, including the Houses of Parliament, New Scotland Yard, Downing Street and the MI6 offices. They also recovered CCTV of Ali speaking to police officers while carrying out reconnaissance in and around Whitehall. The police officers told investigators that Ali had been excitable and asked questions about their equipment and what they were doing. CCTV footage showed Ali on the morning of his intended attack as he purchased the three knives along with innocuous items including a potato masher and cloths – police believe this was an attempt not to raise the suspicions of shop staff. They also recovered footage of Ali disposing of his phone in the Thames at Victoria Embankment that same morning. Police dredged the river in order to retrieve the phone, and forensic analysts pored through Ali’s internet history and data, finding he had conducted Google Streetview searches of the MI6 building on the day he walked around its perimeter. There were also a number of images of police officers, including armed officers, stored on the phone. WATCH: Footage of firearms officers arresting Khalid Ali as he approached Whitehall, central London on 27 April 2017. Dean Haydon, Senior National Coordinator for Counter Terrorism Policing, said: “It is apparent to me that Ali spent some considerable years helping the Taliban create – and maybe even detonate – bombs which could maim and kill many people in Afghanistan. All this before turning his attention to killing people in his home country. “His intended targets were people who represented the UK authorities and he demonstrated a particular interest in the police, how they worked and what their capability was. “Ali did not count on the joined-up working of the UK counter terrorism network and its partners internationally. Together, we have stopped a terrorist attack and put before the courts an individual whom I suspect thought would never be held to account for his crimes overseas. Anyone who sees anything suspicious is urged to report their concerns to the police by filling in the secure form at www.gov.uk/act or calling police in confidence on 0800 789 321.